I don’t typically star gaze in the celebrity sense. If I did, I would’ve sought out Wayan back in 2015 during my first trip to Bali. Ketut Liyer, the famous palm reader from the same book and movie, “Eat Pray Love” was already experiencing dementia back then. So I passed on spending my money and time on him. (Note: According to online sources he died in June 2016 at the ripe age of 100). At the end of a two plus week adventure last March, I scheduled for a half day tour on my way to the airport. Heavy rains botched my rice terrace and waterfall plans. Fortunately I remembered that Wayan’s new clinic was a short distance from my last hotel. My driver, Kadek and I did a drop in. In Bali, it seems there are no advanced bookings, walk in only. Everything is so relaxed in Bali so you just know to go with that flow and wait your turn. This wouldn’t work where I practice – the land of schedulicity (I made that up), deadline, obligations and Type A’s. Fortunately she was there alone with her staff. (In the picture above you can see a photo of Elizabeth Gilbert hanging above the clinic entrance). 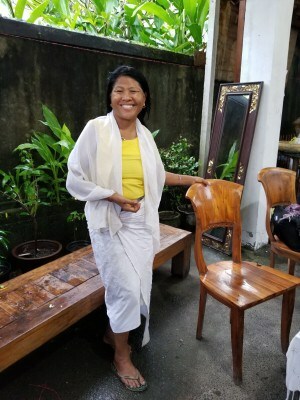 She appeared with a warm smile, dressed in a yellow traditional Balinese dress and her long black beautiful hair extending past her waistline. Upon learning that I am a doctor who writes for a blog, her face lit up! In her broken English (not as good as portrayed in the movie of course) she proudly talked about Elizabeth Gilbert and the thousands of people from around the world she has helped and many who return on a regular basis. Make sure you see the video below. She is talented, for sure. During the session, she revealed things about me which even I forgot. It is obvious she loves life, love and healing. 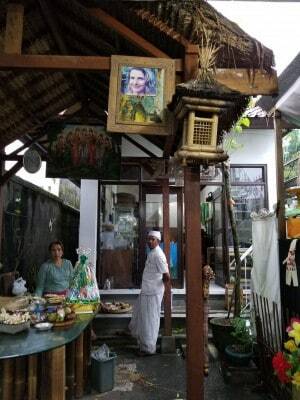 Despite her Eat Pray Love fame Wayan seems to live humbly. (Photos are posted on Facebook and Instagram) She suggested I return in a few months so she can finish “unlocking the secret”. What secret? Was I that messed up that she couldn’t do everything in one visit? Possibly, maybe, who knows? In Bali, you just listen to the healers, follow their directions, trust their instincts and go with the flow. Disclaimer: She gave me a discount on this session and spent extra time with me in exchange for allowing me to interview her and record everything. This partial sponsorship in no way influenced this story. This is my objective interpretation of what happened. Wayan does herbal healing, spiritual healing, water blessings and several other things from which I think I received a customized combo. She starts with a blessing on her altar. She then has you fill out a form by ranking the top three areas of your life you want to know about. After the ritualistic blessing, she begins with postural exam and observation, not in a biomechanical sense. She knew nothing about me, but pointed to my left shoulder (bingo, nailed it!) and left jaw and neck (nailed it again) She claimed I have low back pain. (No, I never have or had low back pain but then I wondered if this was a prediction). And she verbalized some other findings while writing her notes on my consultation form. I advise recording your session because her handwriting is not very legible. She made observations, most of them quite accurate in almost every part of my health and life. But here is what impressed me the most: After holding my closed fist up against a wall for what seemed to be forever, she mapped out my entire relationship history by reading my hand. She traced by love life way back to my university years, identifying my age and duration of each relationship (years and months). My jaw dropped with each time stamp. How does she know this? After the timeline rundown, she proceeded to make some predictions about my love life, so hmmmm we will see. Wayan said she will “open my love life” and give me extra medicine for this. Interesting. I really wanted to know more about career and travel. 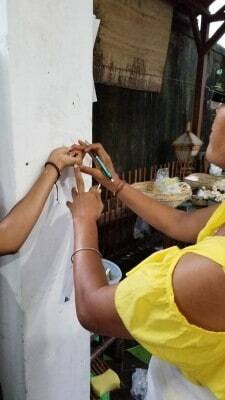 In Balinese traditions, everything is centered around family. Settling down with the right husband seems to be the main objective for women in Bali. (I was able to relate to Elizabeth Gilbert. I got a few raised eyebrows from some locals when I emphatically stated I am here alone.) And of course she emphasized again, my need to return in a few months so she can “open the secret” and get the “negative energy” out of my neck. Interesting. The Balinese like many traditional healers believe our problems can begin prior to our birth. According to Wayan, one of my issues stems from my fourth month in utero and explained what happened with my parents at that time. Very Interesting. They mixed concoction of medicinal herbs she selected from her garden with some water and proceeded to apply this clumpy watery paste all over me: face, neck, chest, legs arms and upper back. You can’t be bashful in Balinese treatment sessions. They just go where they need to go. Her assistants even lifted my dress and applied it on my abdomen. Thank goodness for the boy shorts over my bathing suit and the change of clothes in my carryon. The first thing out of my mouth was “Wayan! I better not stink because I’m getting on a plane soon!” She just giggled. Your eyes are shut so you may not realize that at one point she places a large smooth stone wrapped in linens over your head. The herbs smelled fresh, but not sweet like flowers. From what I understood this is a type of water blessing to cleanse out negative energies. 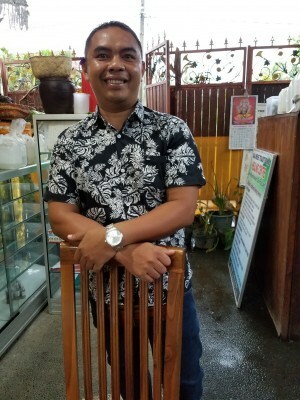 Wayan Nuriasih’s lineage includes many generations of healers. “My great, great, great grandfather was healer”, she proudly stated and she started healing at the age of 6. (See the short video with her explanation, HERE) She uses her intuition, her knowledge she obtained from several sources and the water from her backyard, which she claims to be holy water. She gave me some parting advice and recommendations, which some, to this day are helping. So was there a profound effect on me? Not right away but recently yes, a shift and it could’ve been her treatment alone or in conjunction with Mangku Mastra’s Chakra massage the week before….. or my entire Bali experience may have culminated at that moment. Meditation, prayer, positive thoughts are cornerstone in the Bali way of living. This loving woman radiates from the inside and her laugh is contagious (even through our What’s App conversations). 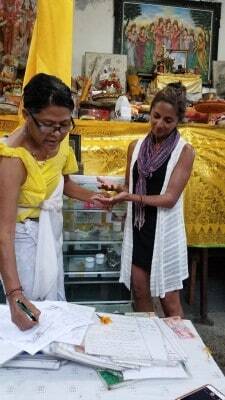 It’s definitely worth the experience, even if only for the notoriety of meeting one of the Eat Pray Love healers. She has you look in her mirror and take a good look at yourself before and after to see your newly developed radiance and youthful glow. I won’t deny that. I did feel refreshed and lighter after all that. I also felt like I woke up energized and had this wicked sense of clarity, more than I usually do after a meditation. 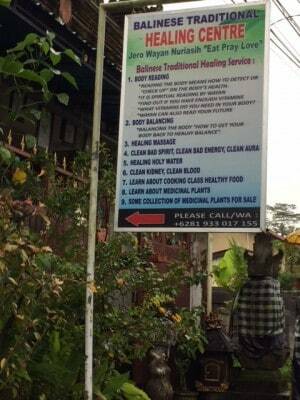 Certainly, next time I am in Ubud but not at the end of my trip so I can try her medicinal plants. And at the very least, to say hello, exchange warm hugs and yes, perhaps “unlock that secret”. Despite her Eat Pray Love fame I was just a little surprised she wasn’t up to date with her online listings. She lamented about her loss of business due to her move four months ago, just a few kilometres away from her previous address (which was actually on the same street as my hotel). Several of her regular local clients still can’t find her since the move. A few days after our encounter she reported with excitement that her nephew updated her Instagram account @wayannuriasih. Also, at the time of publishing this article, she had not yet claimed her Facebook page, however if you search Wayan Nuriasih you will locate her page and see a few fairly recent reviews. For those of you who are curious: her adorable daughter, Tutti, is now 22 years old and she was in the back of the house at the time I was there. If you need a driver to take you to Wayan Nuriasih or anywhere in Bali call my friends, Kadek Melon +6285 935 100 281 or Panca +6281 236 06239. You will certainly not be disappointed. Please subscribe to this blog and my YouTube channel for upcoming articles and updates!